For centuries people have wondered what happened to Britain’s own underwater ‘Atlantis’. Now the truth about the fate of the lost medieval city of Dunwich is being revealed by scientists from the University of Southampton. Using newly-created maps, a team led by Professor David Sear of the University’s School of Geography, has located the remains of one and most probably two of the city’s churches lost to the sea off the Suffolk coast over 400 years ago. 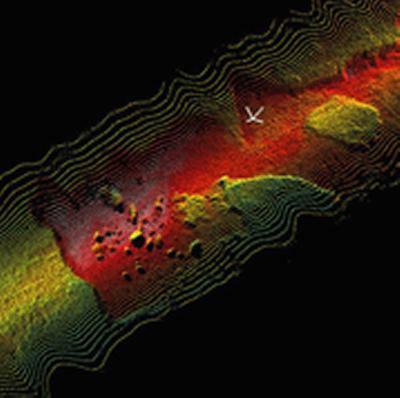 Results from a detailed sonar survey undertaken in May this year revealed the locations of two ruins on the seafloor and today (Monday 22 September) divers will attempt to recover some samples of the masonry from the two underwater sites. The churches lie in less than ten metres of water in a trench that parallels the coastline. Comparison with historical maps confirms that one is the ruin of St Peter’s Church, lost to the sea in the 1690s, and the second is most probably St Nicolas’ Church, lost to the sea in the mid 15th century. Guided by the first ever detailed map of the seabed at Dunwich, divers have already confirmed the presence of masonry at the site. The seabed around the ruins is littered with flints, with large chunks of wall standing above the bed. There are also what appear to be worked stone at the sites. Visibility at the sites is very poor, so the divers have to feel the ruins and recover a sample to confirm the origin of the materials. Although they cannot see the ruins, they have confirmed the presence of large blocks of masonry including some flat ‘slabs’. The discovery of the church ruins confirms that debris from large buildings like churches, can survive as discrete debris fields on the seafloor, despite cliffs collapsing down onto them. This makes it likely that remains from the other eight lost churches and monasteries still lie covered beneath the sandbank. The city of Dunwich was almost wiped out thanks to storms, erosion and floods. Poor underwater visibility at the site has previously prevented anyone discovering exactly how much of the medieval city remains. The sonar survey has also revealed that over two-thirds of the city lie buried beneath sand banks. The current survey has been funded by the Esmee Fairbairn Foundation, English Heritage and the GeoData Institute. EMU Ltd conducted the sonar survey. The dive is being carried out by Historic Wreck Recovery. The findings of the survey will be presented as a new public display for the Dunwich Museum, documenting the technology used and what the project has revealed of the lost city. Professor David Sear of the University of Southampton has more than 20 years’ experience of project management for over 30 projects undertaken for international, national and local clients, including research councils and UK Government departments. He has published more than 100 books, reports and scientific papers in a wide range of outlets both academic and popular. Stuart Bacon has more than 36 years’ experience of the study site, being the first person to attempt a scientific survey of the ruins of Dunwich. He has had considerable success in managing underwater survey projects at the site. The GeoData Institute at the University of Southampton www.geodata.soton.ac.uk is an environmental consultancy with more than 25 years’ experience of GIS, website development and working with industry, Government and heritage organisations in delivering similar projects. EMU Ocean Survey is an international oceanographic survey company with more than 25 years’ experience of deploying a range of coastal and ocean survey equipment in support of international and national business clients.